Discussion in 'Axe, Tomahawk, & Hatchet Forum' started by jake pogg, Mar 16, 2018. (OLYMPIA tool,Chinese in origin surely,but,as misbegotten as it may be, Not murthered by me,i found it like that in the dump). Donor all sectioned...I'll use the chunk containing the toe,it's already tapered for about the correct scarf,and is beefy enough to allow for some experimenting. 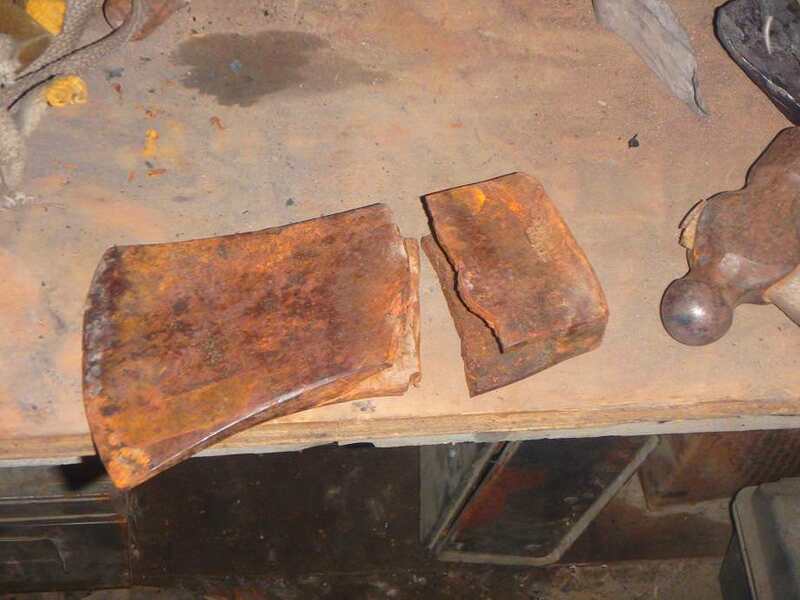 Warning: Don't try this at home.DON'T forge mystery crap-alloys,especially try to never weld them together.Forging is challenging enough without it needing to be a crap-shoot above and beyond the "craftsmanship of risk"factor.Always buy new,known alloys,steel is cheap. Square_peg, Miller '72, phantomknives and 2 others like this. Square_peg, Miller '72 and garry3 like this. @jake pogg - There are Two Craftsmen in this story. Bravo! Square_peg, Ernest DuBois and Miller '72 like this. Thank you Agent_H,very kind of you. I admit it, very curious about what is going on here. 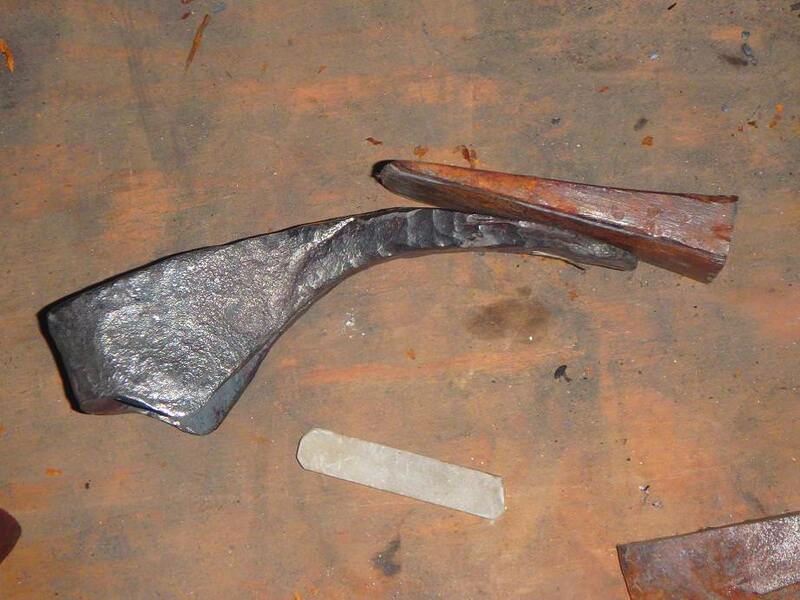 Strictly experimentation, you in need of an adze or someone in need of your excellent blacksmithing skills? It is just a damn rare occasion to see this approach you take. I hope to find out if your "risk" has paid off in the end. Alas,Ernest,if only it was so reasonable...But no,it's pure Art,or madness...and even the risk didn't really pan out(other than to add to my already considerable,but utterly useless,store of knowledge,which we must remember does not equal understanding). 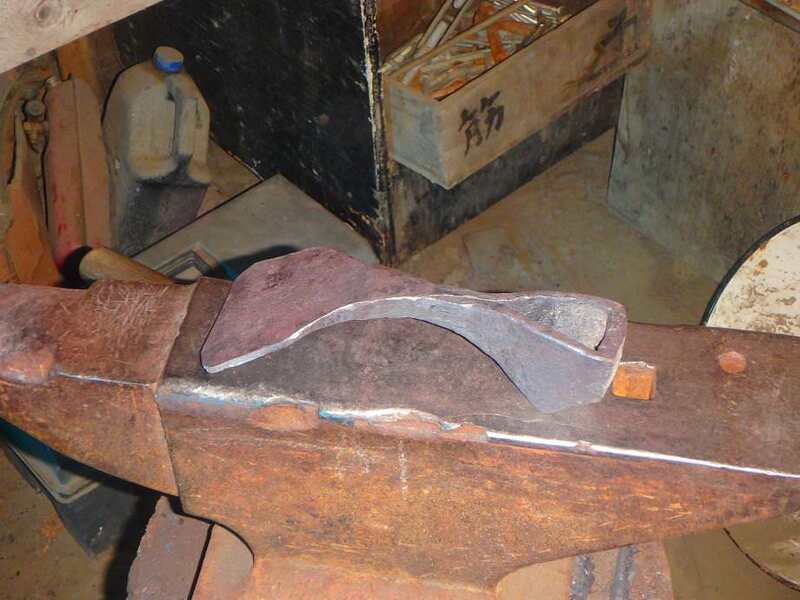 A while back JB has posted that older adze,and it caught my attention for a reason that it had a very well-executed eye of a type i classify as "free-form". 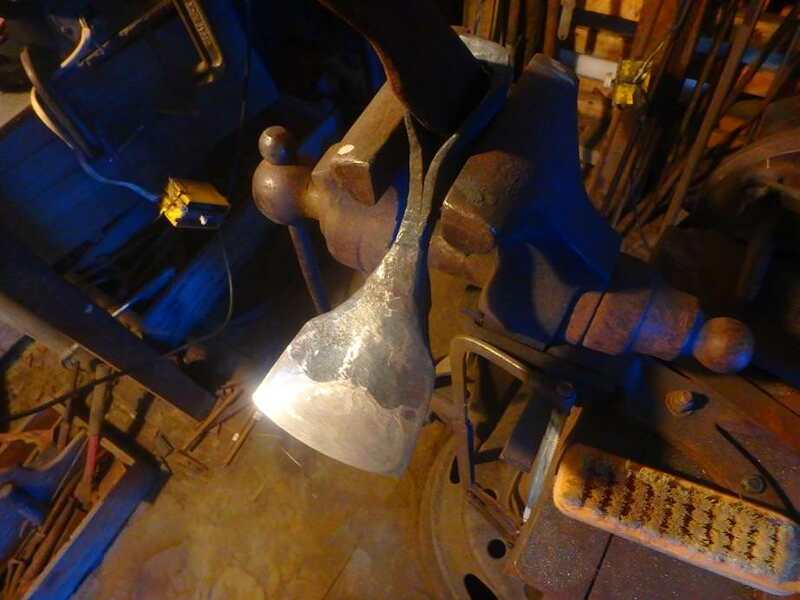 Tool-eyes in general are the most challenging part of a given forging,as they require shaping upon some form(their shape,naturally,being rather critical). That "form", a drift,mandrel,et c.,usually has to be forged for each and every type and size of eye in several sizes,or stages,as the eye gets formed by expanding it gradually. All of this is a tremendous hassle,producing these drifts,very energy and time demanding,especially since they need to be of a decently hard steel. To add to the hassle they also need to be finished with abrasives(as all ironworking tools ideally,but these in particular),and that is something i'm poorly set-up for. So,for a smith that has a severe Attention Deficit Disorder,and must jump from one type of tool to another,it's a bad deal...(you may observe that typically in the past a shop would have a strong tendency to specialise in a few regionally accepted designs,and limit itself to them,one strong motivation for that was always tooling). So that's why i wanted to explore that type of eye seen on JB's example-it's formed randomly,you may say,without the need for a drift. In application,it turned out close to that,but not completely:What i neglected was the correct interpretation of Sequencing the events(crucial in forging). 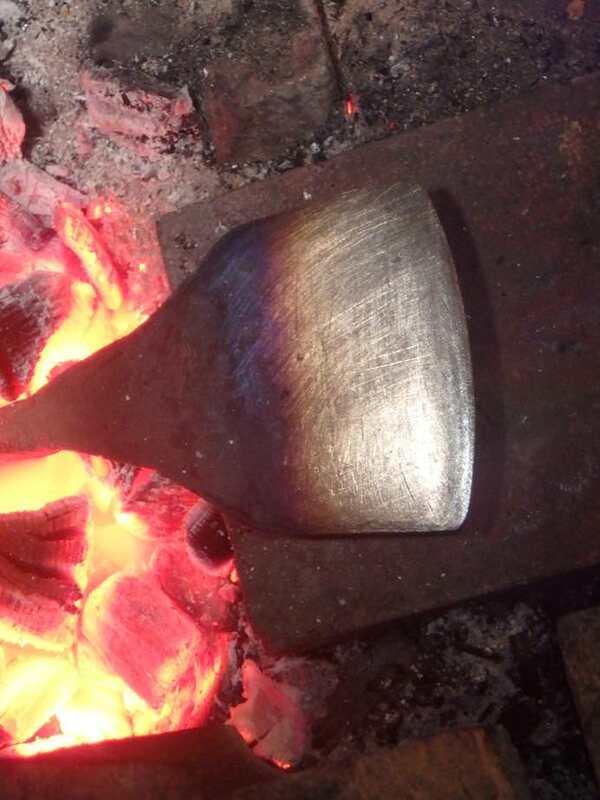 In this case,the heavy-ish forging required to blade the tool has severely stressed the freshly formed and welded eye(not overly robust to begin with),it should've been formed first,the working end of tool. 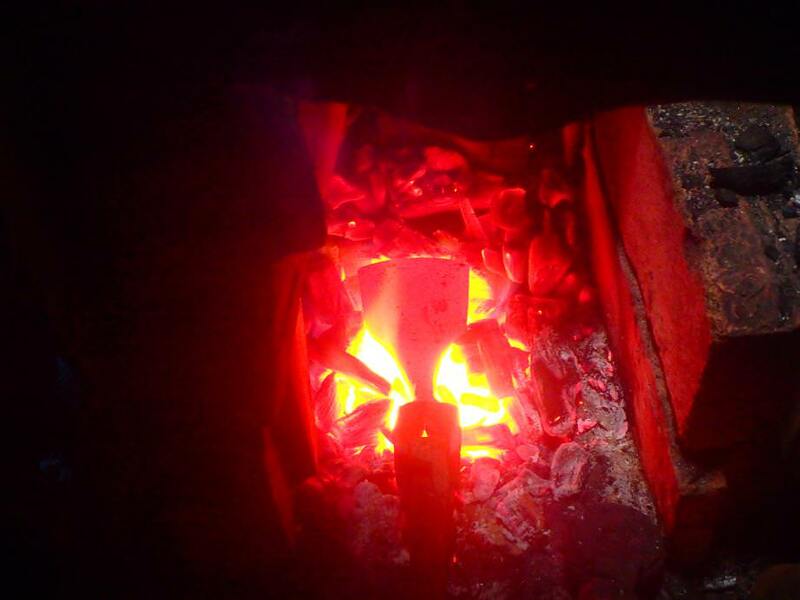 Forging is a harsh,exacting mistress.A "one-armed" smith like me(someone working alone)is challenged severely.For one,it makes the work very vulnerable to harmonics,a dread effect that iron resents most emphatically. Also,as stated above,it is daft to use any old crap,adds a nasty,unpredictable element. I can keep on whining ad nauseum....But will try to come to a point:I'm extremely attracted by tools forged long ago(say roughly Early Middle ages),and since my process is so low-tech to begin with(very primitive conditions,poor light,low quality spruce charcoal,et c.),i was hoping to progress faster,to get further along...But mistakes in interpreting the old methods and technologies are very costly. I see, thank you for laying it out like that and excuses for sticking my nose in there. Where it concerns the woodworker and the smid I'm very interested in the processes at work, and also your reference to David Pye peaked my verdomde nieuwscherighied. Not at All,Ernest.Quite the opposite,i'm sadly alone in this craziness,and very remote from idas and facts that can still be found in the Old World. So really appreciate your interest,as well as the many interesting tools and facts about them that you come up with. And,of course,the Woodwork itself,being the integral part of it all! You wonder how that head cleanly broke in half without some bending or folding having taken place. Did it get so GD (gosh darned) cold outside at one point that a sound smack with a maul or sledge, to dislodge it, or drive it through a piece of wood, shattered it. I did notice (via the mushrooming) that the previous user wasn't adverse to abusing the poll. A buddy in Yellowknife NWT tells me it's not uncommon for car/truck rims to shatter upon 'kissing a curb' or contacting a stone at -40. 'Gosh-darned curiousity/inquisitiveness' is in fact a valuable trait! junkenstien and Miller '72 like this. Jake, I bet you would make a mean axe! You wonder how that head cleanly broke in half without some bending or folding having taken place. Did it get so GD (gosh darned) cold outside at one point that a sound smack with a maul or sledge, to dislodge it, or drive it through a piece of wood, shattered it. BUT-and it's a big But),it's very hard to tell in retrospect.The grain size in the break seems ok,plenty fine,but it may've been left very hard. In some other recent posts with broken axes one sees all sorts of curious effects,some spherical-like spalling,and odd texture changes. Agent_H,thank you,it's kind of you to say this...I Have made a number of axes..I'm not sure that they'd pass as "mean" on Here,though! Seriously,the specifics of an American axe(especially for the last 100+ years) are numerous.The Industrial Age was at it's peak. The machinery was getting intense,the design particulars mutating alongside the tooling. The energy requirement alone,i suppose,was a very significant factor. (Still is . 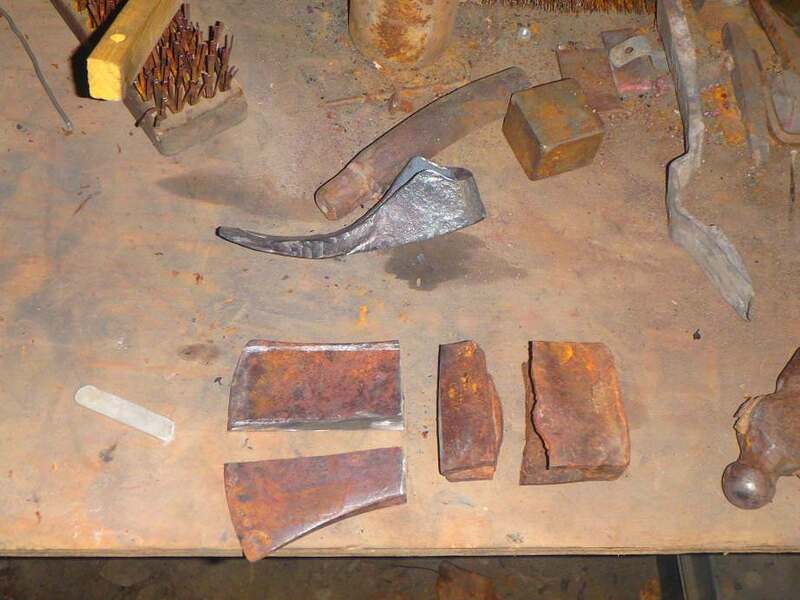 But,yes,axe-forging is pretty much the Ultimate in tool-making. junkenstien, 300Six and Agent_H like this. This is probably one of the few times when i tried to approach the size,And the dynamics of an American felling axe. Fairly massive,around 4 lbs,long haft,mass centered compactly around the eye. As requested by future owner the eye a standard modern 32-36" store-boughten handle. (Why i used such crappy one i honestly don't remember! ...but the ease of availability of replacement was defintely specified). Trailsawyer, junkenstien and Ernest DuBois like this. Looks great jake! There's nothing wrong grain-wise with that handle BTW, and I do like the fact that you achieved such a snug eye fit that only a narrow wedge was necessary. 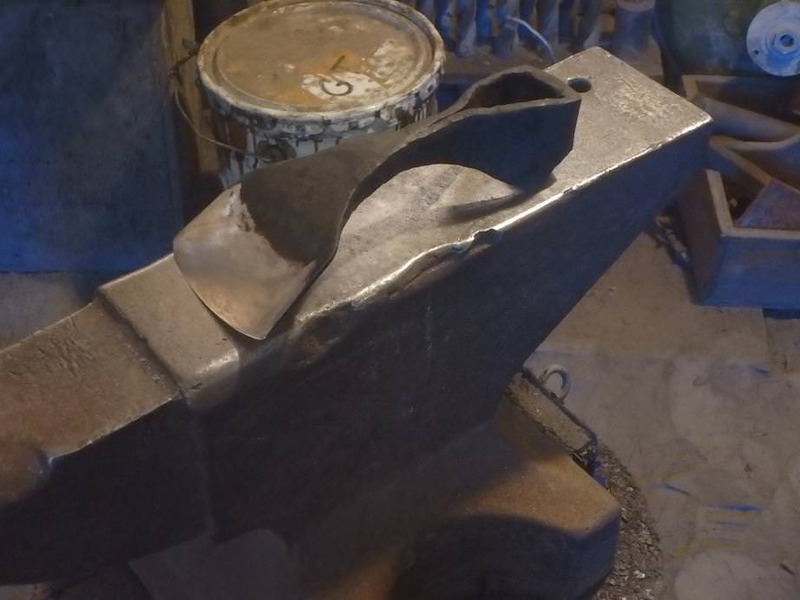 The wedge is Too narrow,and here's the reason:The drift that one makes,for a given eye,makes the eye larger and larger the longer it takes to finish forming the eye(and the surrounding area).It is due to the "draft"(as the foundry people call it,the taper necessary to "draw" anything stuck into hot metal). (sorry for the boring technicalities...but it illustrates how poorly i control the process...). I understand where you're coming from Ought6. I have learned a thing or two living here in the Netherlands these years. One, that questioning for questioning's sake can be interpreted as suspicious and prying and, that cheese should not have flavor. 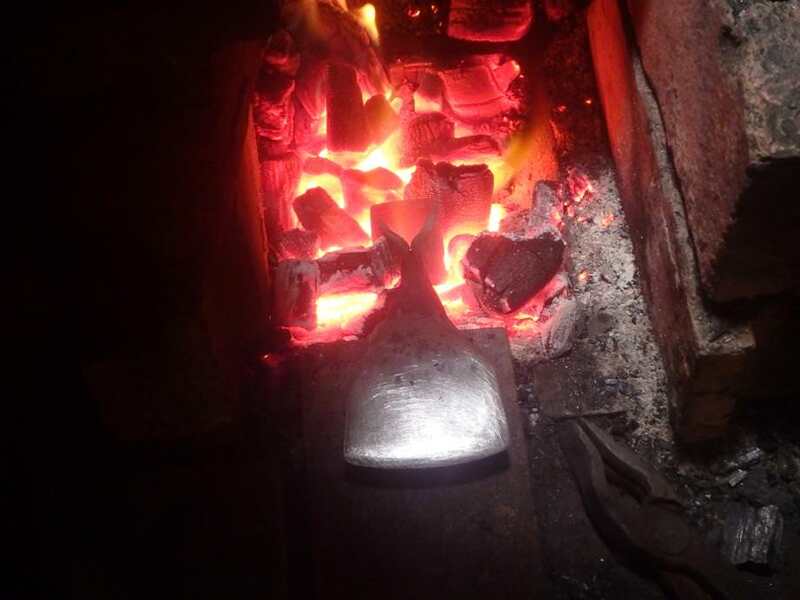 The blade portion of the forging is taken up to past,then right to,then a bit below Critical T to Normalise(reduce grain-size),then again to Austenitic to be held there for a minute and a half,then into (heated)waste-oil. The bands of oxide colors appear.They're closer together than i normally like(i'm impatient and am raising the heat too rapidly),but it'll do...The important thing at this juncture is to make sure that they travel parallel to the edge,if not-there's still time for correction. Till at about This point-(+ a few moments to put away the camera)-the forging goes into oil,terminating the process.This would be said to've been "tempered to Bronze",it's a second or third color(depending on your eyesight)from the beginning,after a couple of yellows,or yellow and straw and then-bronze. 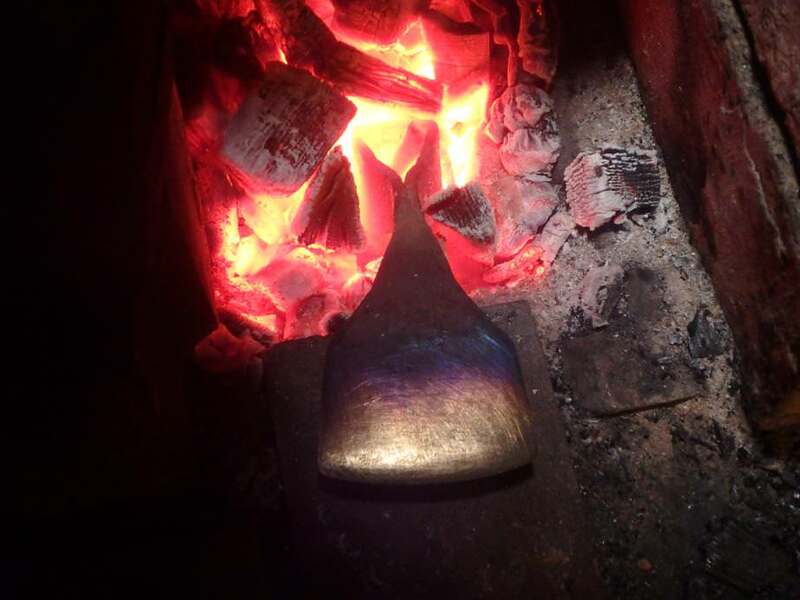 (For a Known alloy this may be a bit too hard for a striking tool,however,we don't know what we're HT'ing here,and,if too hard,the process can be easily repeated.If gone beyond,it'll require the complete normalisation+quench+tempering all over again. Now,back to filing the edge(edged tools are normally heat-treated with the edge about the thickness of a dime).Using the same file as before really gives one an idea of what,if any,changes the material has undergone. Square_peg, Agent_H, crbnSteeladdict and 1 other person like this. Very unconventional, (in terms of the out come because I wouldn't want to make an assessment of the process, so well laid out by the way, anyway) and I think also closer to a kind of work as we can see it in the older tools manufactured on this small and honest scale - I know you focus on the real early stuff like middle-ages but I'm thinking late 18th through 19 century - by these, individual and also so often isolated, craftsmen standing there in their dirty dark holes. I guess you're not really interested in meeting up with other like-minded, (even when they don't know it) tool smids in the near future over here? Well it would be fine to get a hold and try it out, this adze, just for fun. Do you plan on handling? Does it hold so much promise to keep on going? Square_peg, Agent_H and Miller '72 like this.